A parliamentarian who dances and performs for the voters is what these guys want.. Nominations for the Kyadondo East By-Elections were closed yesterday. Bobi Wine was one of the candidates who were nominated by the Electoral Commission. 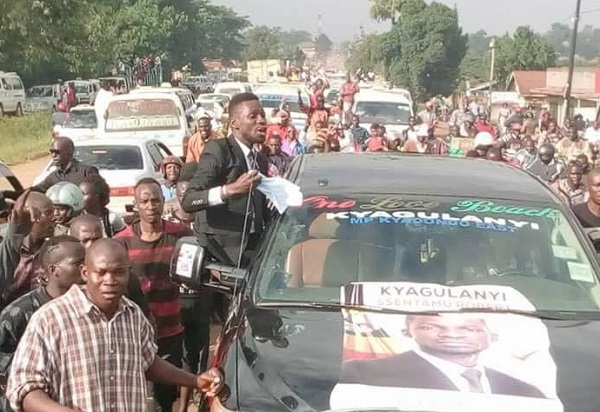 Robert Kyagulanyi Sentamu who was clad in a dark suit with a very short jacket sleeve length was in the company of his wife, Barbie Itungo. 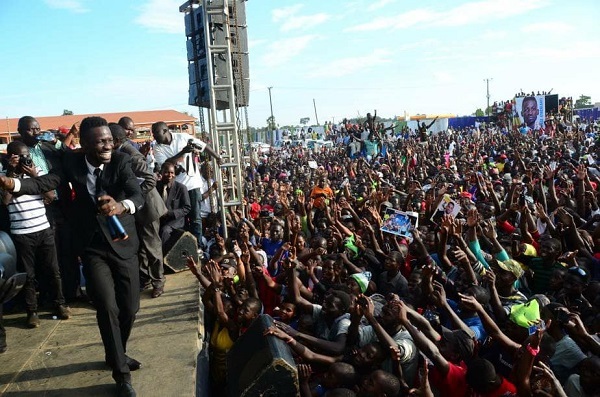 He addressed his supporters at Wampewo grounds shortly after moving around Kasangati area with hundreds of his supporters on boda-boda's and some on a long truck. "As for now, am too tired to think of words to express my gratitude to all of you friends, fans, supporters and well wishers for the love you showed us today." "I am indeed speechless. Yes I expected much, but certainly not this much, this was Too much love. A big thank you to all, God is indeed great," He concluded. He spoke to the voters shortly after being nominated saying that his joining the race is not about NRM or FDC, but he is fighting for the common person. None of the candidates who were nominated yesterday or the day before had followers as huge as Bobi Wine's. In a related development, a candidate who was bitter for not winning to become the FDC flag bearer lost his cool and accused the FDC Secretary General, Nathan Nandala Mafabi for not being fair, thy almost roughed him up, but police was able to calm the situation.